Outlander closes off its second season by delivering on the promises given back in the first episode of the season. The circumstances behind Claire’s return to the present are shown as well as the pay-off of the march towards Culloden shown throughout. This episode gets the feature length treatment and it definitely needs it considering the volume of content to get through. The sheer level of storytelling on display here is staggering and Outlander juggles it all expertly without ever stopping to catch its breath. It definitely demands a lot of attention to keep up with everything it’s trying to achieve, I’m completely on board with a show that encourages the viewer to pay attention because it won’t stop to continually explain itself. As the episode begins we find ourself in 1968 which came as a big surprise to me considering how much focus there has been on the past since the season opened. Claire is quite a bit older and her daughter, Brianna (Sophie Skelton) is now an adult who lives a very happy life. It is established that Frank has passed away so Claire and Brianna are on their own. They find themselves back in Scotland for the funeral of the Vicar who gave Frank the advice he needed to attempt making a go of it with Claire to raise a child that isn’t biologically his. 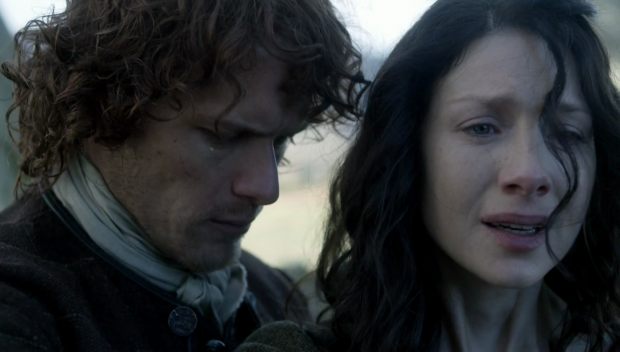 A lot of this episode is focused on Claire feeling nostalgic about the time she spent with Jamie that she was told that she needed to forget about in order to move on with her life. This is combined with Brianna learning the truth about her heritage. Before going into specifics about the episode it’s a good idea to talk about Brianna as a character. There isn’t much time to get a definitive impression of her and the episode nails this right from her introduction. Her striking red hair immediately reminds us of Jamie and her soft features reminded me of Claire so the casting on a purely visual level was perfect. Her personality is also a combination of Jamie and Claire. She is incredibly intelligent and inquisitive like her mother while being passionate as well as full of wonder like Jamie. The debate about nature versus nurture seems to heavily side with nature as far as she is concerned and it makes sense within the context of the story. Brianna is essentially a woman out of time since she was conceived in the 18th century but born in the 20th. 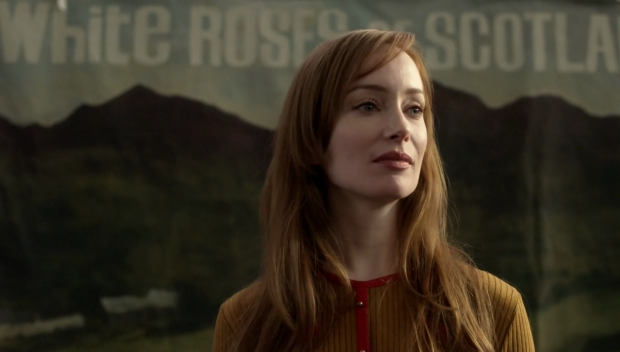 The episode plays on that by her having chills when around Fort William as if connected to the place in some eerie way. Her fascination with history also ties to her true roots since she feels a strong connection to the time period that she “should” live in. Sophie Skelton is excellent in the role and slots nicely into the cast. She is someone I look forward to seeing more of as he importance is sure to increase in the coming seasons. Readers of the books can let me know how she compares to her inky counterpart but as a viewer of the show I’m completely sold on her. It makes sense that these characters would be drawn together given that. This show leans heavily of everything being predetermined in some way. Claire could never prevent Culloden from happening because she was always supposed to be part of those events. Everything she does is following a path that has been laid out for her with the experiences designed to define her life in really interesting ways. I’m not suggesting that there is some kind of higher power at work dictating these things but the past is literally written in stone and Claire was always part of that so she can’t change it. Interestingly her attempts to alter the events that lead to Culloden never really felt that way. There was a real sense that she and Jamie were doing everything they could to prevent it from happening but the circumstances were entirely out of their control. Jamie didn’t have enough sway to change the mind of anyone important and Prince Charles was fully committed to his cause so her influence would also be minimal. Having her not know enough about the particulars of the events leading up to it to turn the tide in the favour of the Scottish was a nice touch as well. Anyway, I have digressed massively here. Roger is an interesting character right from when we meet him. He is grieving for his adopted father and has important information that Brianna needs to uncover the truth behind the circumstances of her birth. 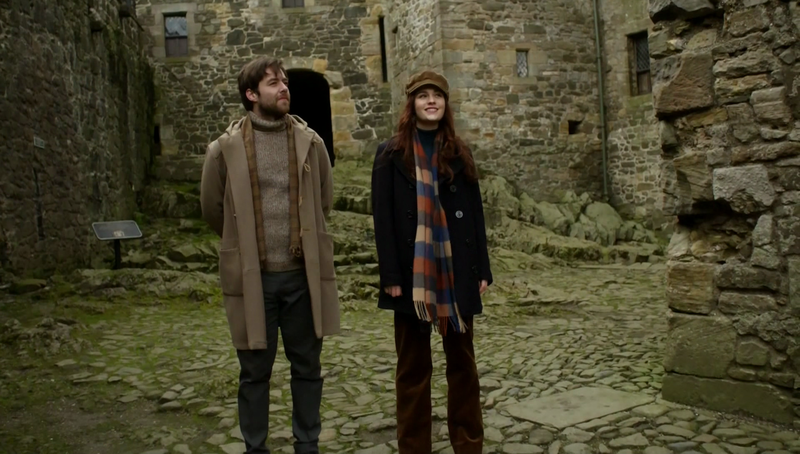 Richard Rankin is an engaging presence and has great chemistry with Sophie Skelton. The episode restrains itself enough to suggest an attraction between them but doesn’t have them act on it quite yet. There’s plenty of time for that so no need to rush their relationship. His connection the the past is also very important to him as he talks fondly about things that happened long before he was born. His heritage is very important to him and he has made peace with the fact that he would never know his real parents because he had such a positive upbringing. He’s very complex and Rankin brings that across wonderfully. As always, Outlander puts the characterisation at the front of everything. The majority of the episode involves Claire, Brianna and Roger travelling from place to place conducting research but it all remains compelling as the reactions to what they find out is emotionally raw. This is especially true in the case of Claire who is almost haunted by the past. It’s clear that she hasn’t allowed herself to dwell on the past in a long time and everything comes rushing back to her now that she’s back in Scotland. Brianna reminds her of Jamie every time she looks at her but other than that she has had no exposure to anything reminding her of her time with Jamie. As a result it’s uncomfortable and unnerving for her to revisit it while also being something that she can’t but pursue. Her trip through memory lane is really effective with so many callbacks to the past that pay off within this episode. Seeing her own name on the deed to Lallybroch with the word Fraser smudged pays off when we see the document signed and a single tear strikes the paper in that very spot. 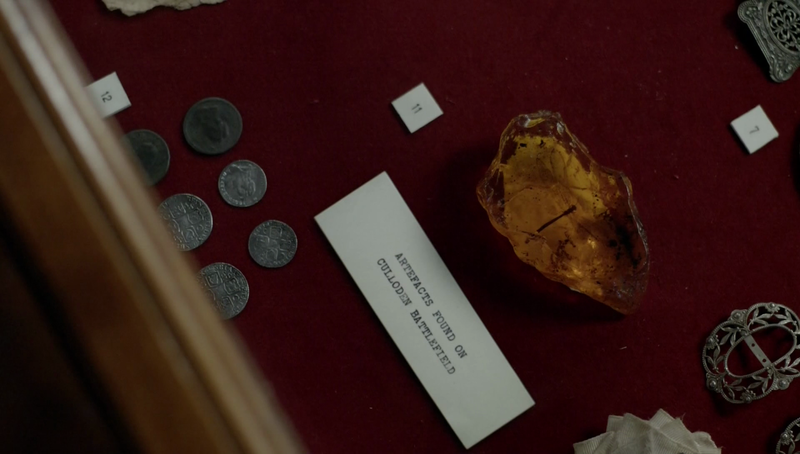 The dragonfly in Amber that gives the episode its title is seen as a museum piece that proves significant when Claire and Jamie part ways. It’s a symbol of their love, marriage and bond so there’s something tragic about it becoming a simple museum trinket with the meaning all but lost. Revisiting the past is a difficult emotional time for Claire and this is a really powerful example of why that is. 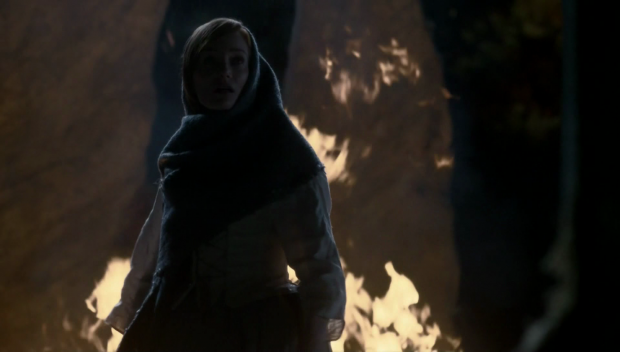 Speaking of the past, instead of functioning as the “present” of the show it is treated as flashbacks which makes sense from a structure point of view as Claire is forced to revisit it and is particularly reminded of the last time she saw Jamie so seeing that punctuates just how she is feeling. In terms of pacing the lead up to Culloden is very quick with a sense of impending doom hanging over it. Defeat is just over the horizon with no way to prevent it so Jamie is forced to accept the fact that he probably won’t survive and Claire is faced with the knowledge that she will never see him again. The way the episode builds the urgency of the situation is masterful with the drama entirely focused on Claire and Jamie. There is a last ditch attempt to change the future. Since Prince Charles is the key to the conflict continuing Claire thinks that killing him is the only chance of stopping it. There is a lot of desperation in her voice when trying to justify it to Jamie who is reluctant because it’s a mortal sin. Ultimately they decide that it’s not a good idea but not before Dougal overhears them and plans to report them for treason. This forces Jamie to kill him in order to keep that secret. The fight between Dougal and Jamie is the big action sequence of the episode and it is really visceral in terms of how desperate the struggle is. Jamie is clearly struggling with having to kill him but also realises that he has crossed a line and has to see it through. Claire helping to guide Jamie’s hand to stab Dougal reinforces the fact that she and Jamie are equals and assume shared responsibility for this. It’s a scene filled with emotional heft and definitely feels like the wrong thing to do. Morality isn’t black and white in Outlander and having Dougal be the one who doesn’t deserve to die despite all of the questionable things he has done shows this. Jamie and Claire’s farewell scene is very rushed but I don’t mean that in a negative way. Both of them know that time is running out but try to have a meaningful moment together before the separate and Jamie goes off to his death. It’s a really touching scene as they both try to articulate exactly what they meant to each other as quickly as possible. There’s even time for them to make love one last time. It’s very quick and lacking in romance but high in passion which reinforces this whole thing being a stolen moment for him. Claire’s desperate plea for him to come to the 20th century with her helps add to the mythology of the show while being a genuine moment for them. 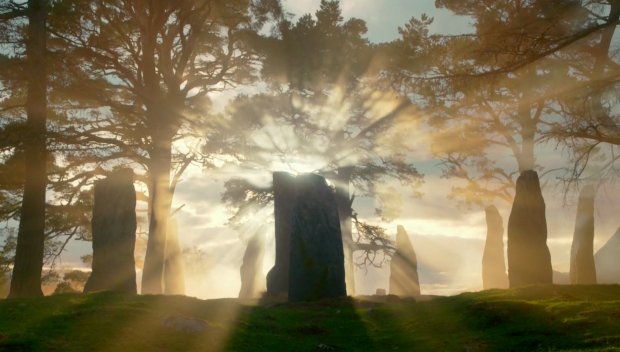 Claire can hear a buzzing when she is close to the stones but Jamie can’t which indicates that only she can travel through time. As I said before, Claire is meant to travel back and forth but Jamie is exactly where he is supposed to be. It’s her journey; not their journey but that doesn’t downplay his contribution to her life. He’s a fully realised character and is very important in her life. This mythology is expanded when Brianna and Roger also hear the buzzing which suggests that the ability to travel through time runs in the family. The reveal that Jamie survived the battle along with Claire’s desire to return to him was a hopeful note to end on and it’ll be interesting to see if Brianna and Roger come along for the ride. I’m fascinated to see if Sam Heughan is going to play an older Jamie or if Claire will return to a time shortly after she left. I’m inclined to think the former since every the two time periods seem to be running in sync. Two years in the past means two years missing from the present so by that logic I’m guessing that Claire will go back to find Jamie has aged as much as she has. Another fascinating thing about this episode is the return of Geillis in the form of Gillian Edgars. I’ve been looking forward to seeing this character return in some form after her hasty exit last season and this appearance really doesn’t disappoint. The fun thing with time travel is that Claire knows the version of her at the end of her journey and has caught up to the point of it’s just beginning for her. Gillian is very different to the woman we knew last season but there are hints of her there. Her objective is made clear by her devotion to Scottish Nationalism and her ramblings about the English ruining Scotland. It’s interesting how timely her words are given real life recent events in Scotland. Being Scottish myself it gave the words more weight. Her plan is essentially what Claire’s would turn out to be. She wants to change the past so that the outcome benefits Scotland. Outlander has never definitively said that the past can’t be changed but the evidence on display seems to point that way. Having her kill her husband to get back to the past is really cold but also consistent with the Geillis we all know. She has such a small role in the episode but it brings her story full circle and allows Roger to exist. Lotte Verbeek is always hugely watchable so it was great to see her again however briefly. The whole discussion about time travel where Claire realises that she has to let Geillis travel back in time so that Roger can exist and she can have an impact on Claire. Maybe Claire is starting to understand the importance of events playing out exactly as they did before. It’s something the show will need to explore in more detail in the coming seasons. 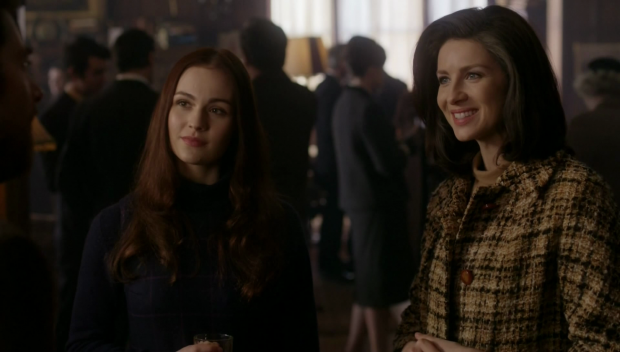 I haven’t talked about the relationship between Claire and Brianna as yet despite how significant it is. From early on it felt completely real to me. The angle of Brianna thinking her mother has gone insane when talking about time travel and being in love with a man from the 18th century is an obvious yet necessary reaction. She comes around to the idea when she sees Geillis disappear but up until that point it’s a ridiculous fairytale as far as she’s concerned. The disappointment she shows when finding out that her mother has lied to her for her entire life is also grounded in reality. Claire essentially committing adultery as well as bigamy by falling in love with another man as well as marrying him while her husband was out there waiting for her isn’t brought up very often and we as viewers see it as being far more complicated than that but the raw facts are fairly damning if you don’t know the details. As far as Brianna is concerned her mother cheated on the man she thought to be her father and then lied about it so that doesn’t paint her in the best light. Claire defends her life choices without hesitation and the argument they have is impressively heated. Both actresses bounce off each other beautifully with plenty of love and pain in their interactions. It’s as good a mother/daughter relationship as I’ve seen in a long time and it’s filled with sincerity. I look forward to seeing more of it. Not everything about the episode was perfect though. Considering the entire season has been building up to Culloden it would have been nice to actually see the battle. Leaving such an important thing out of this episode is a misstep as far as I’m concerned but I wonder if it is being saved for next season to show how Jamie managed to survive it. There could have been some kind of cliffhanger during the battle that can be picked up later but leaving it as the sound of gunfire in the distance was very disappointing. I also didn’t quite buy that Geillis would be so quick to kill her husband in the name of her plan to aid Scottish nationalism. Fair enough if she was cutting all ties to the present with no plans to return but her character wasn’t established well enough to suggest that she was capable of murder at this point in her development. It was necessary to further the plot certainly but needed a little more development. Having Frank die off screen is another misstep. The episode is largely about Claire’s relationship with her daughter while she finds out her origins but the lack of Frank is noticeable. When Claire promised to be faithful to him and forget about Jamie back in the first episode of the season I thought there might be some time spent on how that relationship is supposed to work. Are they just keeping up appearances or is Claire able to find affection for him once again? It’s a question that isn’t really answered and it means the loss of a good character who still had lots of potential for interesting stories. I imagine this was another purely plot driven decision. Claire couldn’t revisit the past when Frank was in her life because she promised not to so in order for everything to happen in this episode he would have to be out of the picture. It’s entirely possible that future episodes will show earlier points in Brianna’s life but for now his presence was missed. There’s lots of potential for the next season and I can’t wait to see what happens when Outlander returns next year. Having Claire and -potentially- Jamie be older is an interesting and unexpected idea that can go in really interesting directions. The addition of Brianna and Roger is positive as well. It’s going to be a long wait. An excellent character driven finale that introduces some new relationships while dealing with the existing ones. There’s so much heft to everything that goes on and the entire cast conducts themselves wonderfully. Not seeing Culloden and the absence of Frank are a little disappointing but the overall viewing experience was excellent. I am very glad that you enjoyed this episode and are looking forward to the next season. Now that you’ve met Roger and Brianna, I want to let you know that in the book – Dragonfly in Amber (DIA) – it begins in 1968. When I read the first couple of pages, I was like – WTF, I missed something, am I reading the correct book? It is not until the scene when Claire starts telling Roger and Bree about Jamie that we resume in France (in the first book, the Abby where Jamie recovers is is France). Many other (and I would say most) book readers have felt the same whiplash. Ron Moore decided to make the show more linear [to soften the blow] and I remember from interviews in 2015 that there was talk about having more Frank time on screen in S2. That is why we have 201 set in 1948. The third book reveals a little more about Claire and Frank since 1948 and about Claire’s transformation into a surgeon. In this episode, in Claire’s VO on Gillian’s notes, pay particular attention. 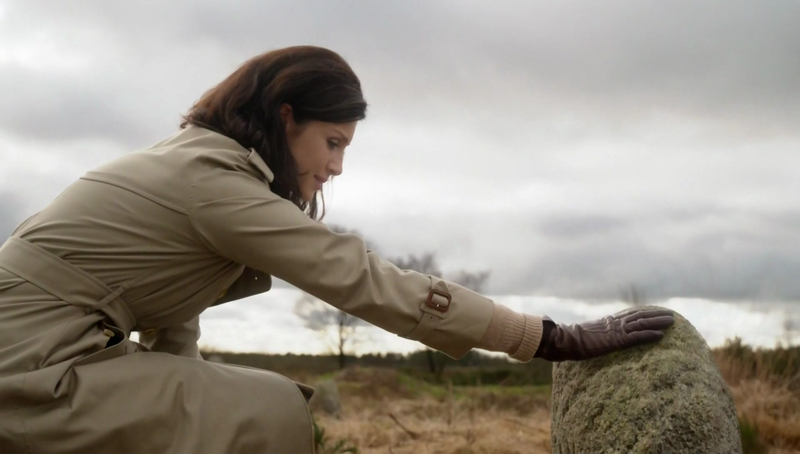 Also go back to episode 201 and look at the ring that in 213 Jamie put on Clair’s finger just before she goes through the stones. One last note, DIA did not cover the Battle of Culloden. The time in 1746 ended at the standing stones too.